Please read the original post for details on how to use this tool. 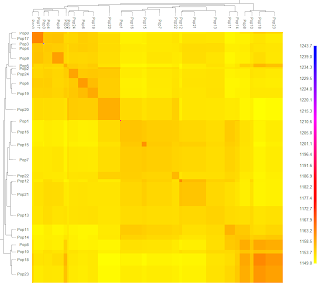 People who have tested using the Genographic Project's Geno 2.0 test can now use the DIYDodecad tool with their data. The raw data download from this test has a slightly different format than the ones from 23andMe and Family Finder, so it is necessary to convert your data in a format that DIYDodecad can interpret. hgdp.base.txt which includes additional information about SNP markers that is not found in your Geno 2.0 raw data download, and which is necessary to complete the conversion process. Once these two files have been extracted into your working directory, the process of using DIYDodecad is exactly the same as for any other user of the software. 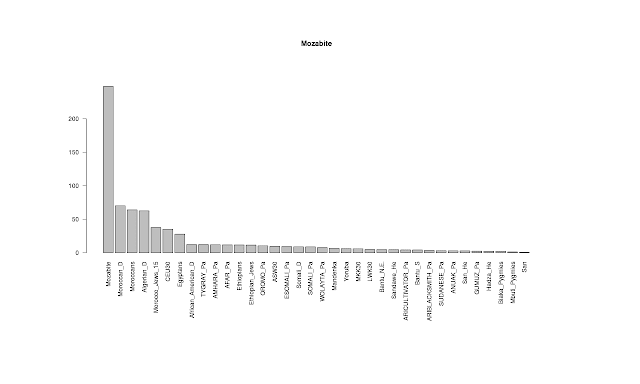 where johndoe.csv is your unzipped raw data download. This will write a genotype.txt file in the working directory, and you can proceed the rest of the way as per the instructions. You can use all ancestry calculators released by the Project (or indeed other projects); the most recent one is globe13. 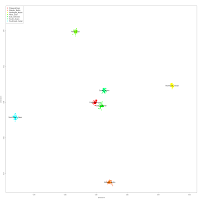 You should be aware, that because the Geno 2.0 test includes a smaller number of SNPs, and because globe13 and other calculators were developed using the common SNP set of 23andMe and Family Finder, the analysis using globe13 will only include ~34 thousand SNPs and will be "noisier" than usual. In the future, I might develop new calculators that make use of the SNP set of the Geno 2.0 test itself. PS: Feel free to post a comment below if you experienced any difficulty converting your data; also thanks to CeCe Moore for graciously sharing a raw data file with me, which allowed me to build this converter. Apparently, the data format has been changed for some Geno 2.0 data downloads. If your data includes a [Header] ... [Data] preamble followed by a list of 5 comma-separated values, ignore this. If it includes a header "SNP,Chr,Allele1,Allele2" followed by a list of 4 comma-separated values, you should follow the instructions as above, but use company='geno2new' instead. 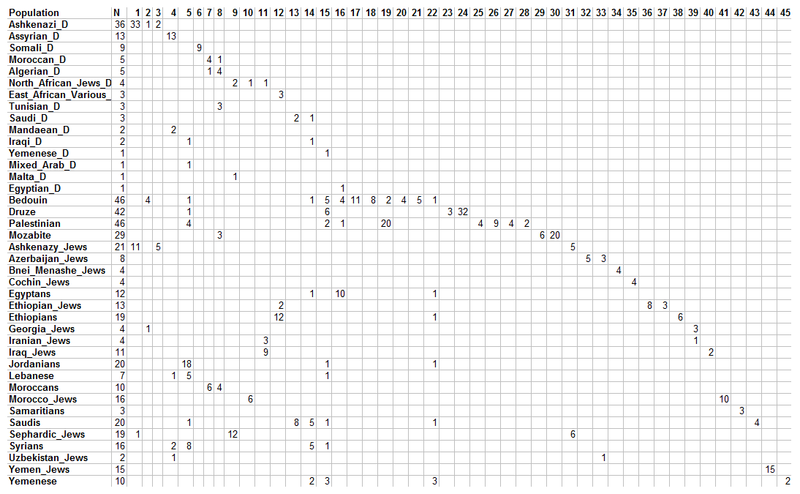 Project participant results for the globe13 calculator can be found in the spreadsheet. Population median results and Fst divergences are also included. Fst divergences between ancestral components can be found here. You need to extract the contents of the RAR file to the working directory of DIYDodecad. You use it by following exactly the instructions of the DIYDodecad README, but always type 'globe13' instead of 'dv3' in these instructions. 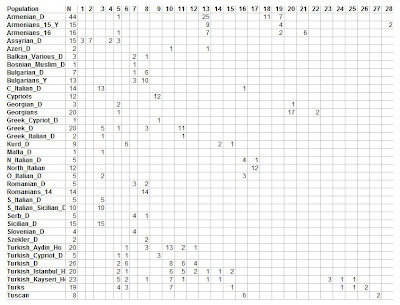 You can consult the spreadsheet for proportions of the 13 components in different world populations. Patterson et al. 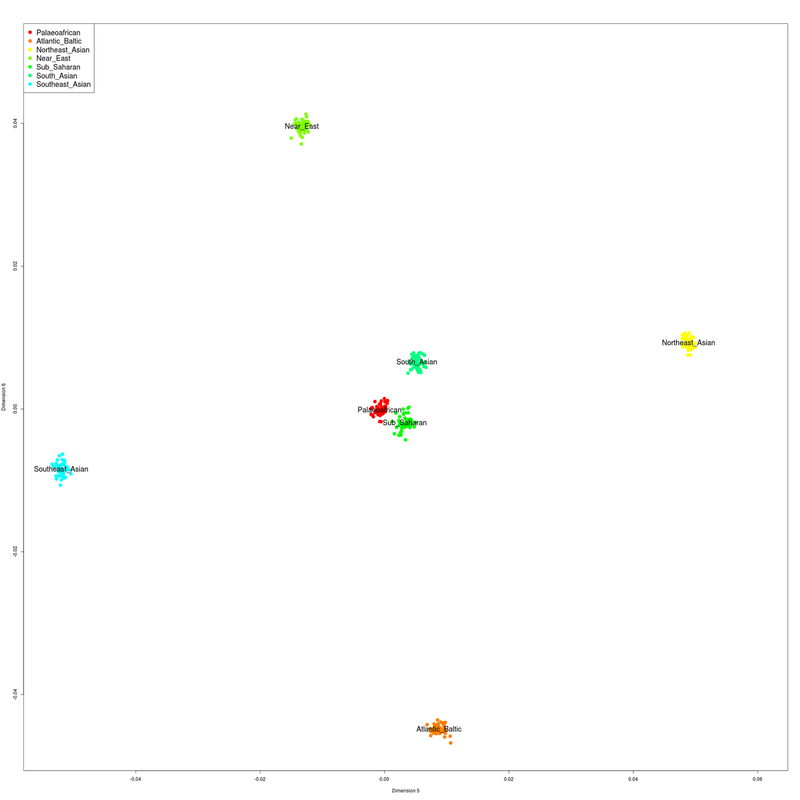 (2012) recently published evidence for admixture in northern Europeans between a population resembling modern Sardinians (and the Neolithic Tyrolean Iceman, whose genome was published earlier this year), and, surprisingly Native Americans. 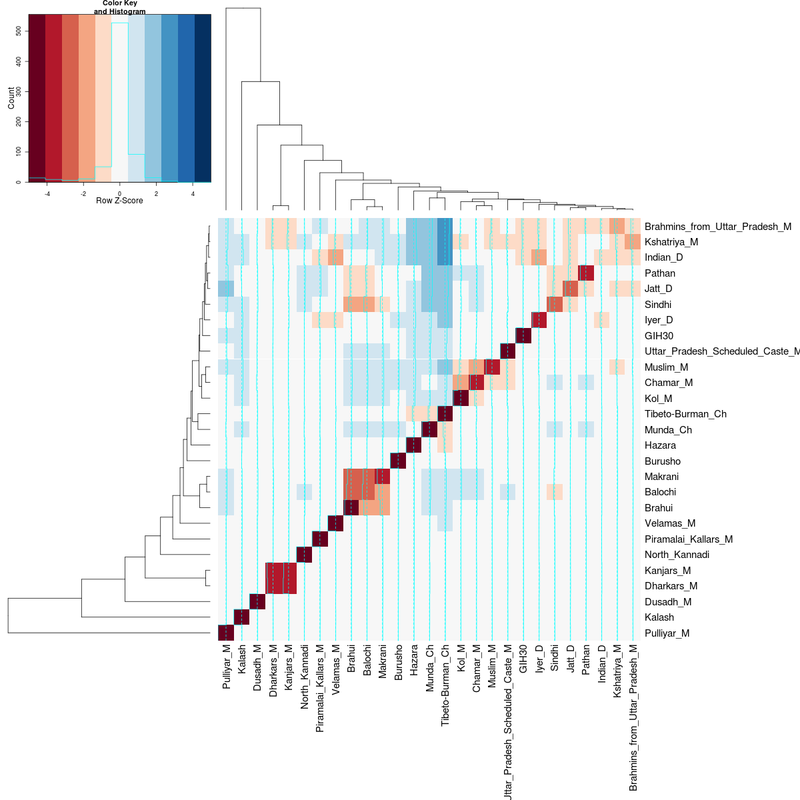 The authors attribute the Amerindian-like ancestry element to a North Eurasian population that spawned Native Americans, and which also contributed ancestry to northern Europeans. They propose two possibilities for the origin of this admixture: (i) the Mesolithic Europeans resembled Amerindians, or (ii) there was an influx of Amerindian-like populations from the east during late prehistory. 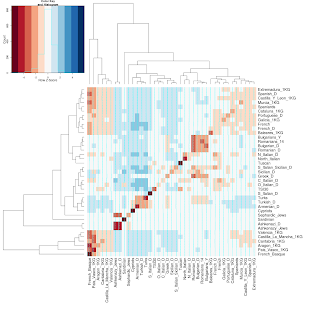 A palimpsest of these two processes may explain parts of the observed signal of admixture. 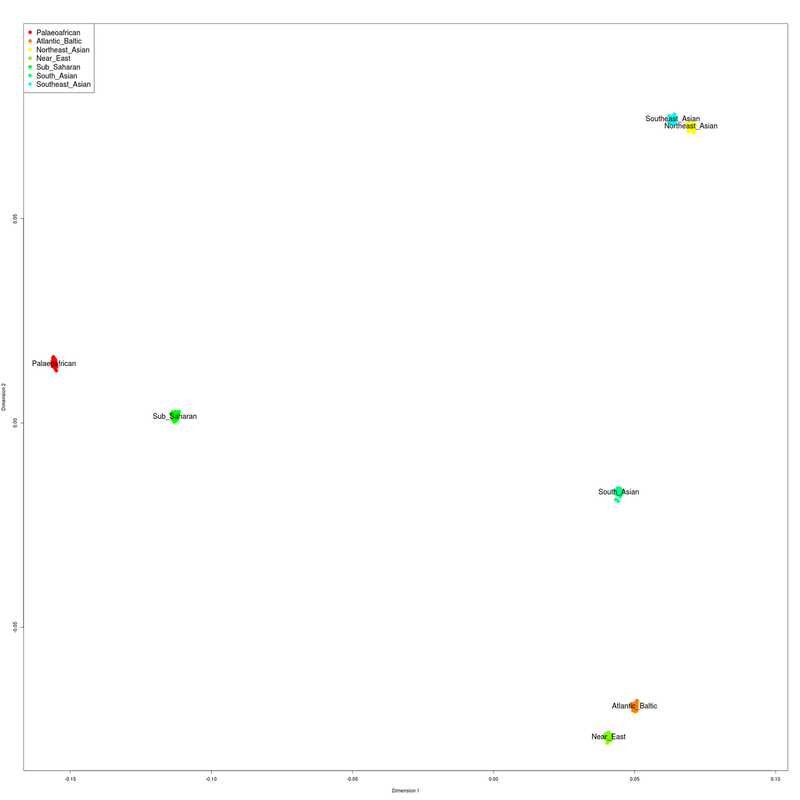 In a recent K=4 admixture experiment, I demonstrated that ADMIXTURE software produces an Amerindian ancestral component that closely tracks the signal of admixture using the D-statistic test. I have decided to make this test available for download and use with DIYDodecad. It is important to remember that some of these components track different aspects of ancestry that is better resolved at higher resolution. There are also populations that "don't fit well" in this 4-partite scheme (e.g., certain African or Australasian populations). 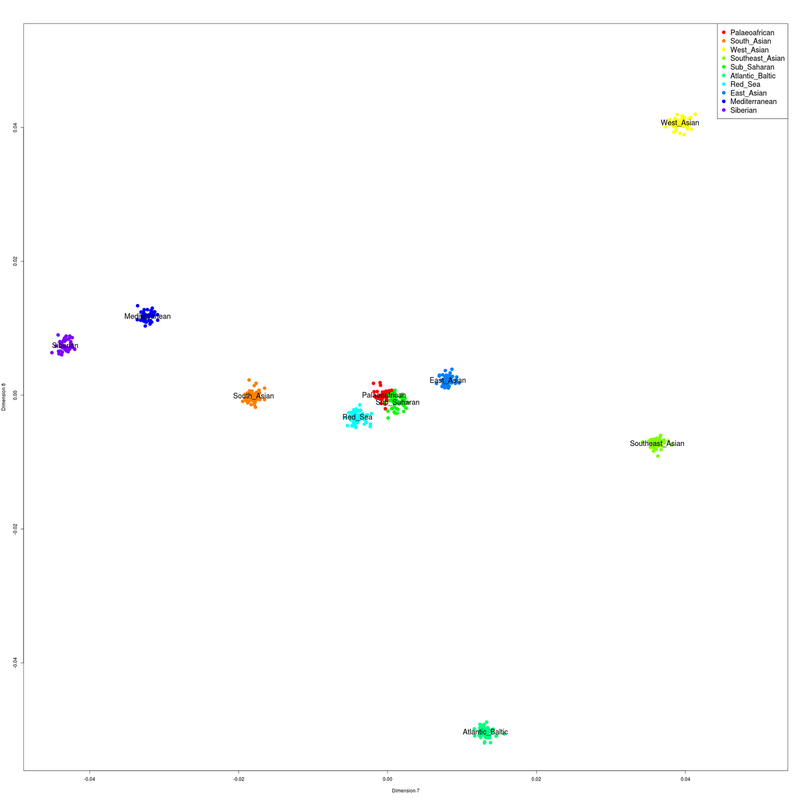 For example, the Amerindian component of this test may indicate (i) real recent Native American ancestry, (ii) East Eurasian ancestry found in Siberia and East Asia, (iii) the common signal of admixture differentiating most European groups from Sardinians and Near Eastern Caucasoid groups. 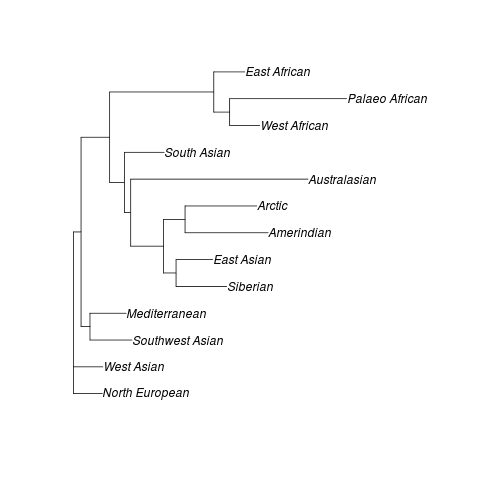 Similarly, the Asian component may indicate Australasian, South Asian, or East Eurasian ancestry. And, the European component tracks the ancestry of individuals from West Eurasia in general, although it reaches is maximum in Sardinians. 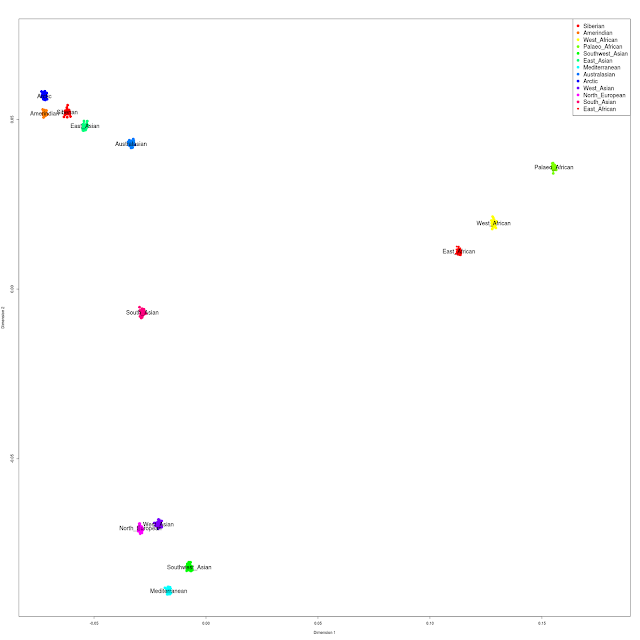 This test may, however, be useful to Old World individuals who want to get an idea about the signal of admixture discovered by Patterson et al., so I decided to make it available. For individuals who don't suspect recent Amerindian or Siberian/East Asian ancestry, and who don't belong to populations with recent such ancestry, the Amerindian component will most likely represent the aforementioned signal. You need to extract the contents of the RAR file to the working directory of DIYDodecad. You use it by following exactly the instructions of the DIYDodecad README, but always type 'globe4' instead of 'dv3' in these instructions. You can consult the spreadsheet for proportions of the 4 components in different world populations. If anyone has received results from the Geno 2.0 test of the Genographic Project and want to share it with me, feel free to send it at dodecad@gmail.com. I will not distribute it or share it with anyone. 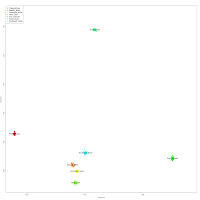 I want to see what SNPs are tested, what format the data is in, and what is its intersection with other available datasets. This way, I can update my DIYDodecad software so that Geno 2.0 testees can use the various calculators released by the project to get an alternative ancestry assessment. In time, and if there is interest, I may release additional calculators that make use of the particular SNP set tested by Geno 2.0. 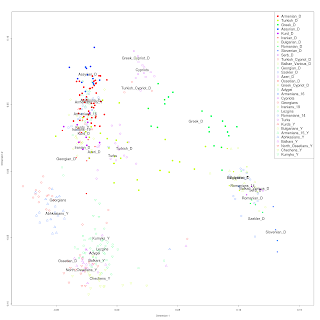 These were analyzed in the context of a large set of African populations. 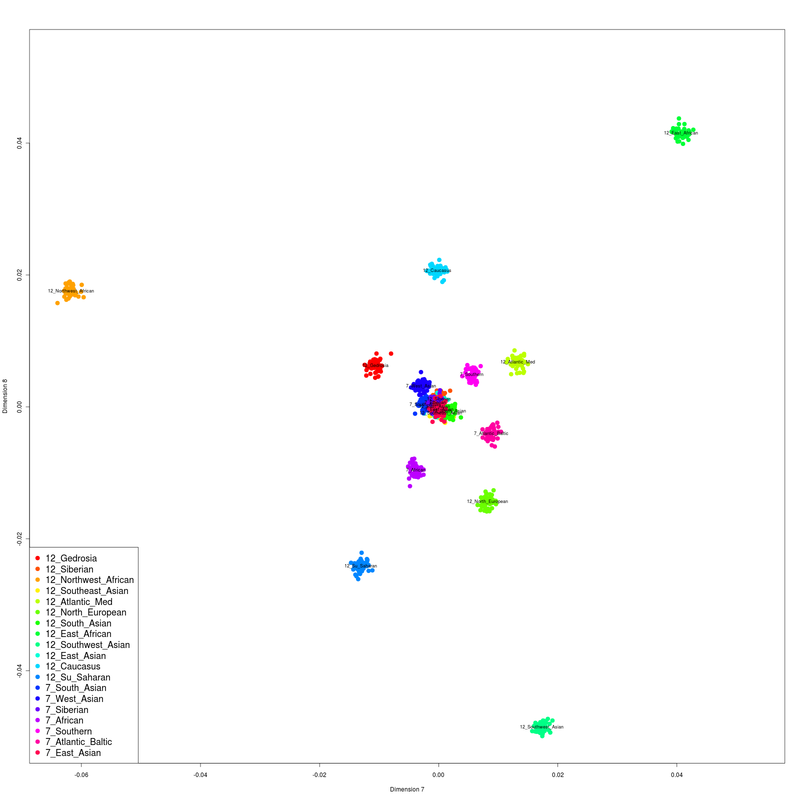 CEU European Americans were also added to account for the European admixture present in some African American individuals. This is the first time I have included African American Dodecad participants in this type of analysis. 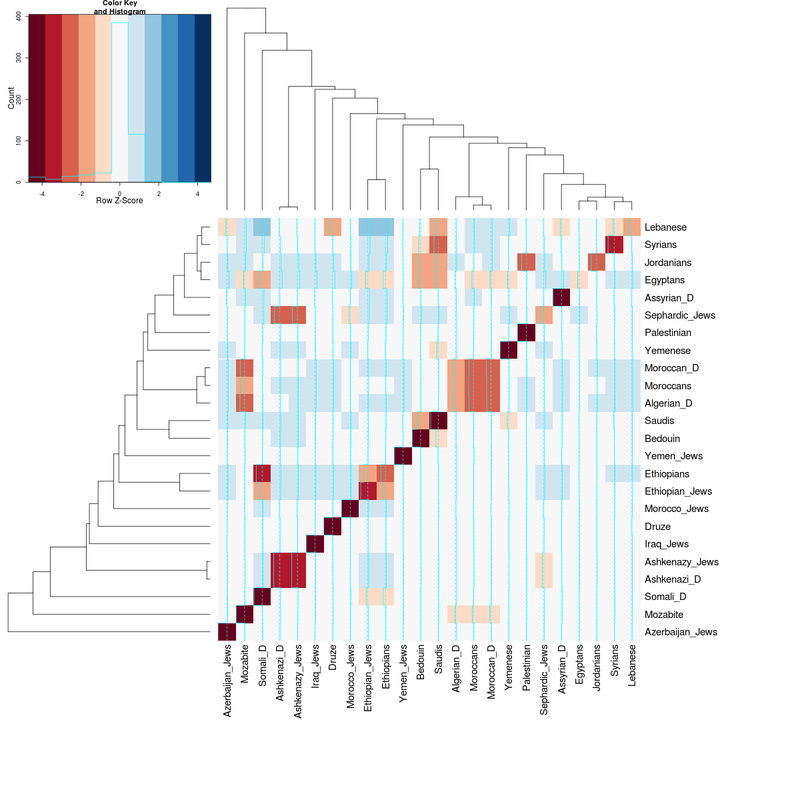 fastIBD identifies segments of relatively recent origin that are shared by individuals. 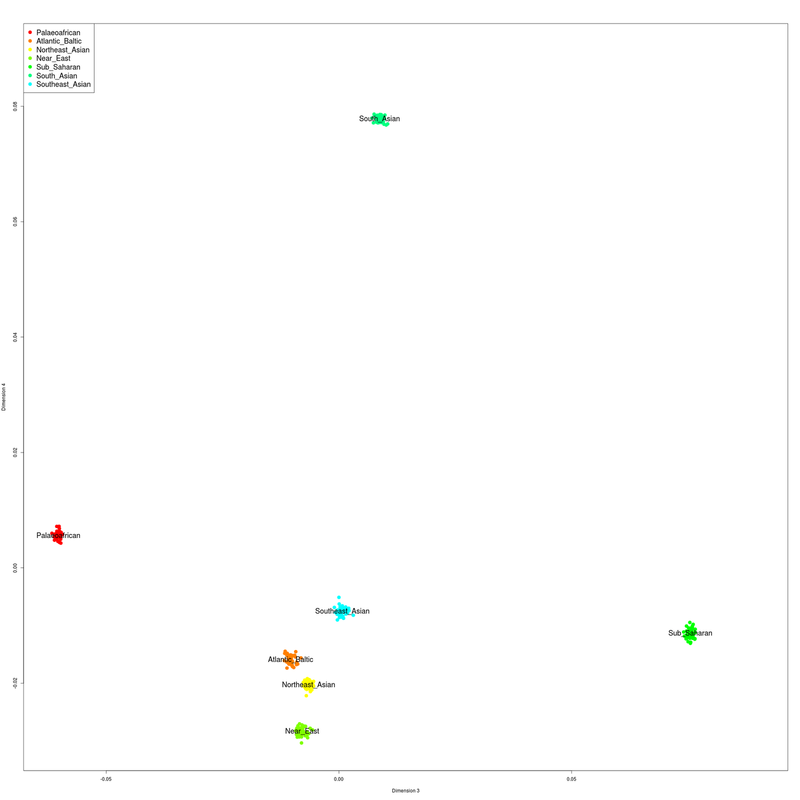 These results should not be construed as measures of overall genetic similarity or origins. 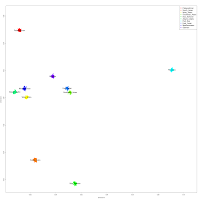 Rather, they suggest which populations have exchanged genes in the relative recent past. Population-level graphical results, showing an ordering of other populations based on median IBD sharing. IBD sharing was assessed only for populations with 5+ individuals. within the Bantu group (Bantu_NE, LWK/Luhya, and Bantu_S), only the South Bantu have an excess of IBD sharing with San. Notice that of the Ethiopians/East Africans it is the Omotic speaking Wolayta that seem to especially share IBD with the Ari people who are also Ethiopian Omotic speakers. Mozabites showing a high degree of within-population IBD sharing, and secondarily with other NW African groups. 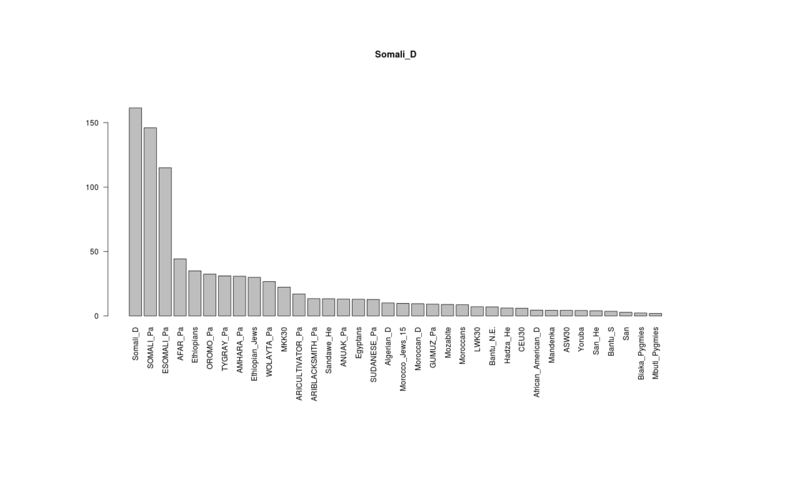 The Dodecad Project Somali sample shows high degree of sharing within itself and also with the Pagani et al. Somali and Ethiopian Somali samples, and then with various other East African groups. Sources of data are listed at the bottom left of this blog. On the so-called "Calculator Effect"
However, many people are getting skewed results, despite doing everything right. For instance, users from the UK often come out much more continental European than they should. Some of them actually believe that this is because they're genetically more Norman or Saxon than the average Brit. Nope, the real reason is what I call the "calculator effect". 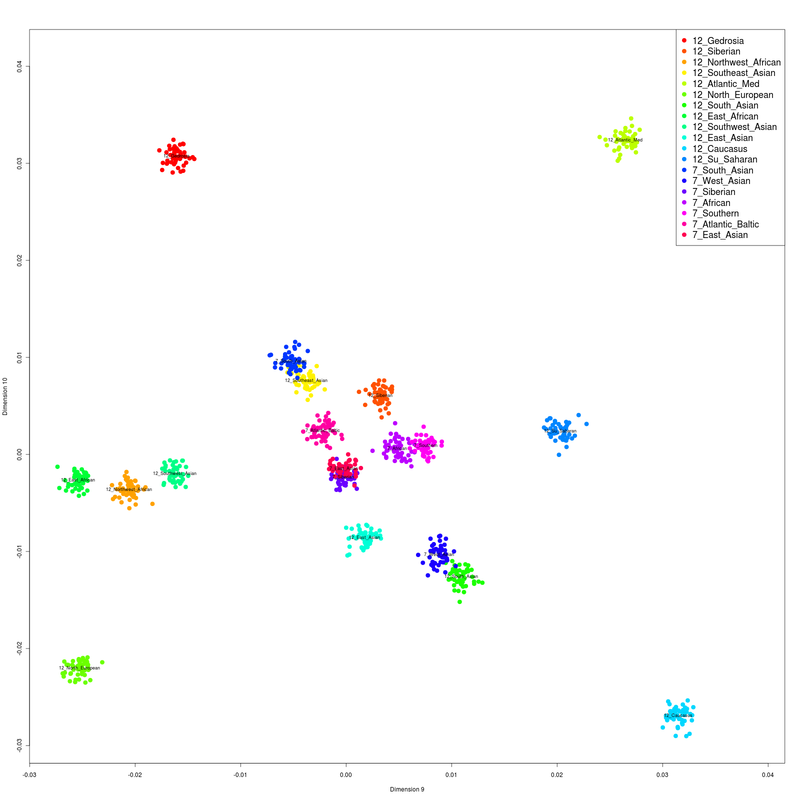 This is when the algorithm produces different results for people who are part of the original ADMIXTURE runs that set up the allele frequencies used by the calculators, than those who aren't, even though both sets of users are of exactly the same origin, and should expect basically identical results. This, however, was described by myself many months prior, in Novemeber 2011, following up on observations made during my first analysis of Yunusbayev et al. Armenians in September 2011. It has been listed in the Technical Stuff at the bottom of this blog ever since. I had observed at the time that the newly available Yunusbayev et al. 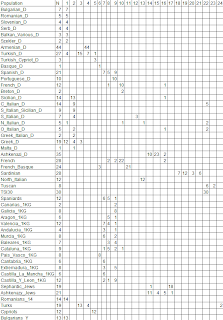 Armenian sample appeared more "European" using the Dodecad v3 calculator tool, which had been built using the Project Armenians (Armenian_D) as well as the Armenian sample of Behar et al. I then explained why this was happening, and released new versions of the Dodecad tools, such as K12a, and K12b, and more recently K10a as new scientific and project participant samples became available. I actually designed my Eurogenes ancestry tests for Gedmatch with this problem in mind, by only using academic references to source the allele frequencies. 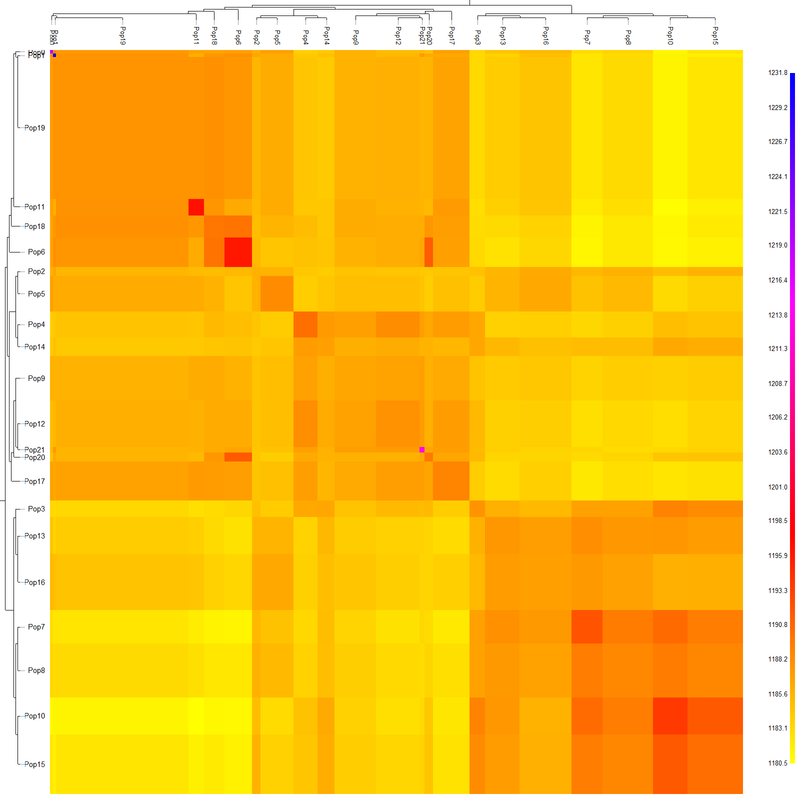 This means that test results for Eurogenes project members and non-members are directly comparable. Perhaps other genome bloggers can eventually do the same? The only effect of this "solution" is to ensure that there is a "calculator effect" for everyone using his tools. For example, if he uses only published Finns and Lithuanians to build his calculator, then every Finn and Lithuanian who takes his test will wonder why he is "different" from the published Finns and Lithuanians, because they will all suffer a "calculator effect" with respect to the reference populations. So, perhaps they will all be on equal footing with respect to each other, but their results will all be biased because of the issue I had identified. Moreover, their results will never improve as more people join his Project, because these new people will not be included in newer versions of calculators: all users of DIY Eurogenes tools will continue to receive sub-par results. Well, small consolation, at least they'll all receive comparable sub-par results. It is only by adequate sampling, that is by including more and more people, rather than excluding even the ones we have, that ever more accurate admixture estimators can be devised. As sample sizes grow (= more scientists publish their data, and more people join projects such as this one), allele frequencies of the different components will become ever more secure, and deviations of individuals who did not contribute to the inference of the genetic components will converge to zero. 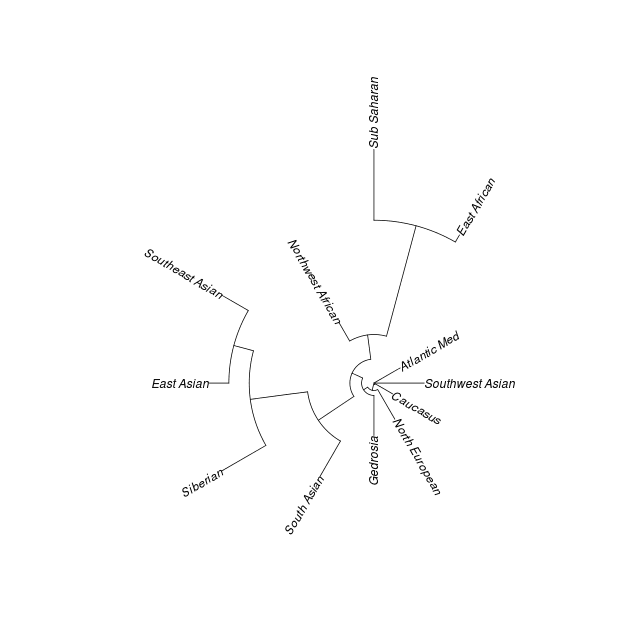 I am already quite confident that inclusion biases amount to only a few percent for Dodecad Project tools and only for the closely related components (e.g., West Asian vs. North European); as mentioned in my original post, these biases are trivial for more distantly related components (e.g., European vs. East Asian). And, the way to further reduce biases that do persist is to foster participation, rather than consign everyone to a sort of fossilized mediocrity, excluding whole populations of active direct-to-consumer customers (e.g., Norwegians, or Assyrians, or Iraqis, or Germans, or Koreans, or, ...) on the basis that no "academic reference" has made dense genotype data on them freely and publicly accessible. 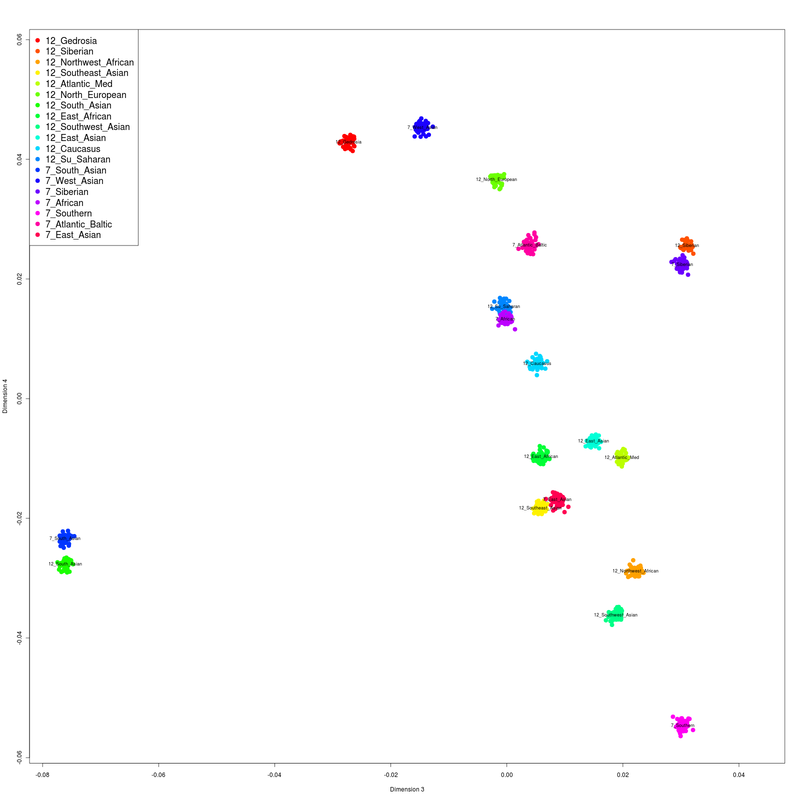 These were analyzed in a context of a complete set of Central/East Eurasian populations; West Eurasian populations included were mostly Uralic and Turkic speaking groups, and a few others (such as East Slavs or Iranians). 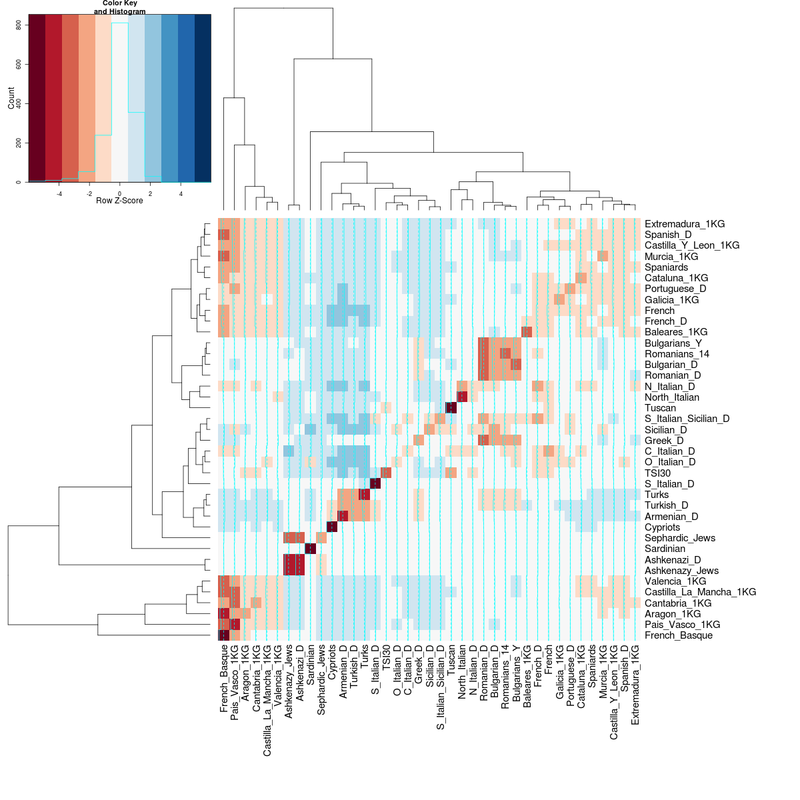 Notice high levels of within-population IBD sharing for Finns, consistent with a population that experienced expansion from a small number of founders (small ancestral population size). Compare with Turks, who are a much more diverse population. 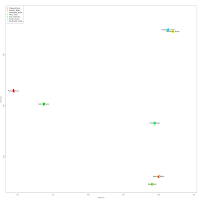 These two plots (you can check the spreadsheet for exact numbers) indicate different sources for the East Eurasian element in Turks and Finns. The top eastern populations for Turks are: Turkmen, Chuvash, Uzbek, Uygur, all of which are Turkic speakers, followed by Hazara, Yukagir, and Selkup. For Finns, there is high degree of sharing with various Siberian groups of different languages, including Uralic Selkups (16.4cM) and Nganassan (9.6cM). Turks share less with these Uralic speakers (6.4 and 2.8cM respectively). 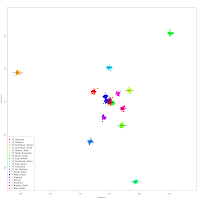 So, these are strong hints of common shared ancestry within the Turkic and Uralic language families. 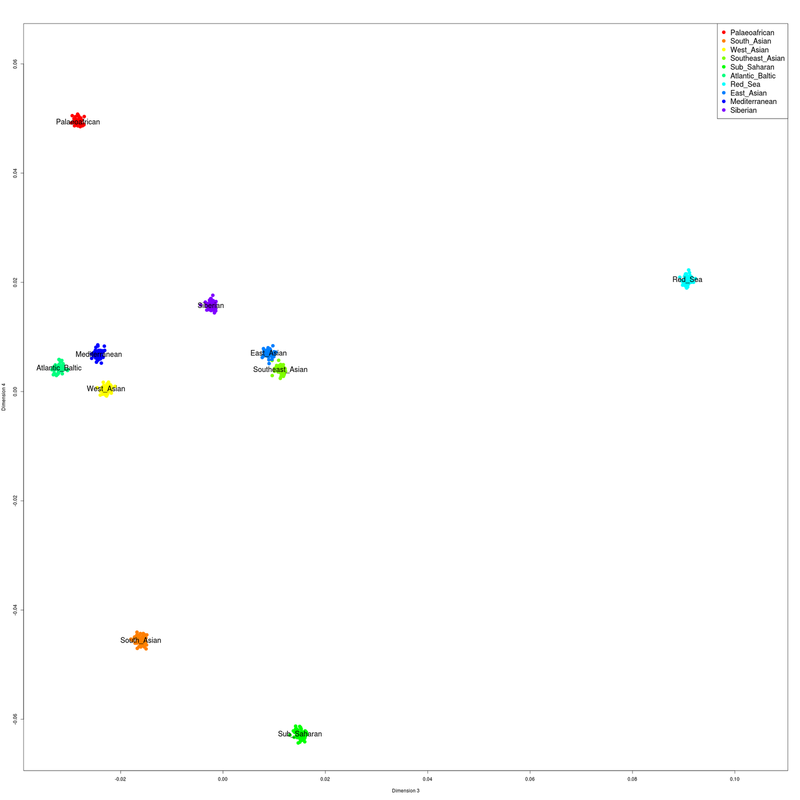 Results from this study maintain that the Chuvash are not related to Altaic or Mongolian populations along their maternal line, thus supporting the “Elite” hypothesis that their language was imposed by a conquering group —leaving Chuvash mtDNA largely of Eurasian origin. 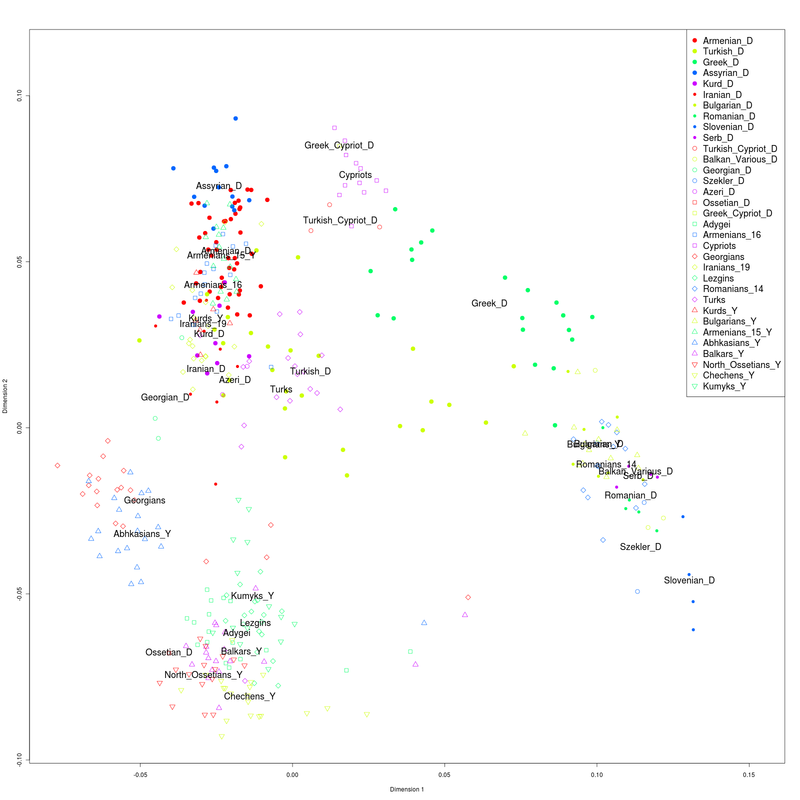 Their maternal markers appear to most closely resemble Finno-Ugric speakers rather than Turkic speakers. There are a couple of points of interest; first, the Red_Sea component related Arabians with East Africans. 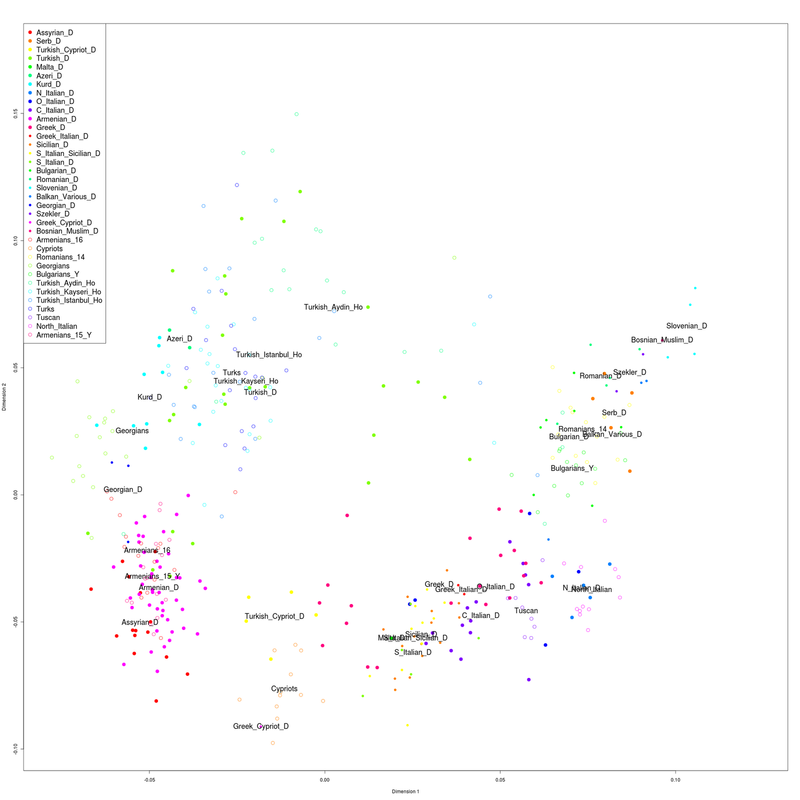 At a higher level of resolution the "Southwest_Asian" and "East_African" (K12) components emerge. The "Red_Sea" component is not very closely related to any other components, but is somewhat related to the "Mediterranean" and "Atlantic_Baltic" components. 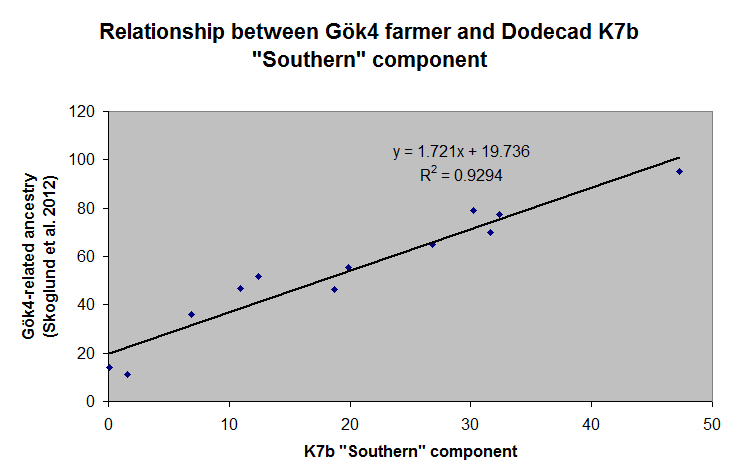 So, using the different calculators of the Dodecad Project, we first have (K7) a contrast between Africa and West Eurasia, then a signal of the shared ancestry between Arabia and East Africa (K10), and finally, strong signals of local ancestry in the two regions. Second, the Mediterranean component here is modal in Sardinians as usual, but also projects into North Africa. 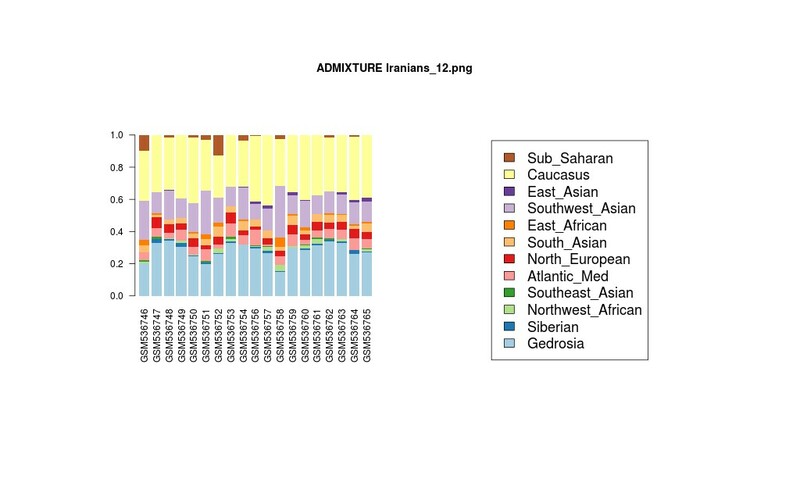 Again, this is intermediate between K7 which shows a predominance of West Eurasian ancestry in North Africa + an African component, and K12 in which there are "Atlantic_Med" and "Northwest_Afican" regional components. These are strong hints that the West Eurasian element in Africa differs between NW and E Africa. In the former region, it is most related to Sardinians, and in the latter it is most related to Arabians. Of course, ultimately the two elements are related to each other. Project participants can find their results in the spreadsheet. Non-participants can use DIYDodecad to calculate their results, but they should place all the calculator files in the same directory as the DIYDodecad software, and replace 'dv3' with 'K10a' in all the instructions of the README file. Component labels are indicative, and you should compare your results against the normalized median results for different populations included in the spreadsheet. 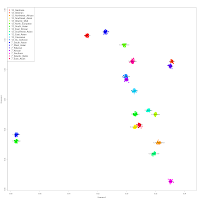 The 'K10a' admixture calculator is courtesy of Dienekes Pontikos and was developed as part of the Dodecad Ancestry Project; more information here. The West Eurasian cline is formed between the Near_East and Atlantic_Baltic components. Project participants can find their results in the spreadsheet. Non-participants can use DIYDodecad to calculate their results, but they should place all the calculator files in the same directory as the DIYDodecad software, and replace 'dv3' with 'weac2' in all the instructions of the README file. 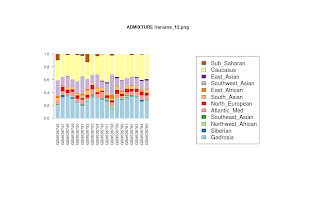 The 'weac2' admixture calculator is courtesy of Dienekes Pontikos and was developed as part of the Dodecad Ancestry Project; more information here. I have taken Table S15 from Skoglund et al. 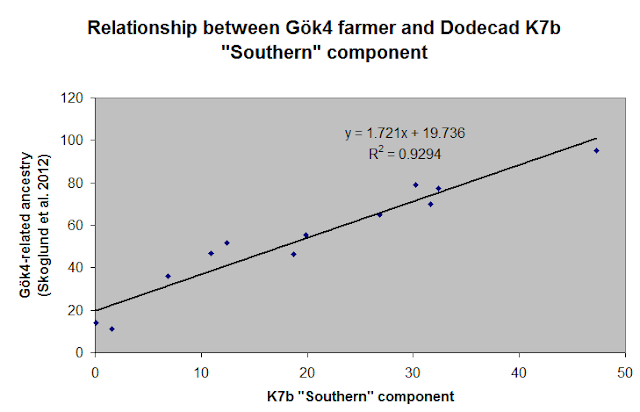 (2012), and the Dodecad Project K7b admixture proportions in order to investigate possible relationships. 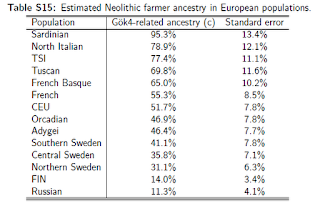 In Table S15 the authors estimate the Neolithic farmer ancestry in several populations on the basis of a single Neolithic individual from the Funnel Beaker (TRB) culture which was found in a megalithic burial in Gökhem parish. 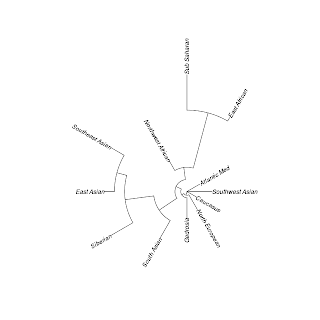 Most of these populations are already part of the Dodecad Ancestry Project, except the three Swedish samples; given the intermediacy of the Central_Sweden sample, I have decided to use my Swedish_D sample of Project participants as a stand-in for it. The correlation between the two variables is very strong (R-squared = 0.93). 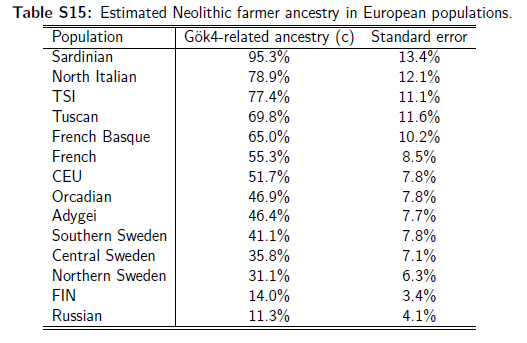 I anticipate that when I am able to study the Neolithic Swedish genomes directly, the Neolithic farmer from Sweden will turn up "Southern" in a K=7 resolution experiment. 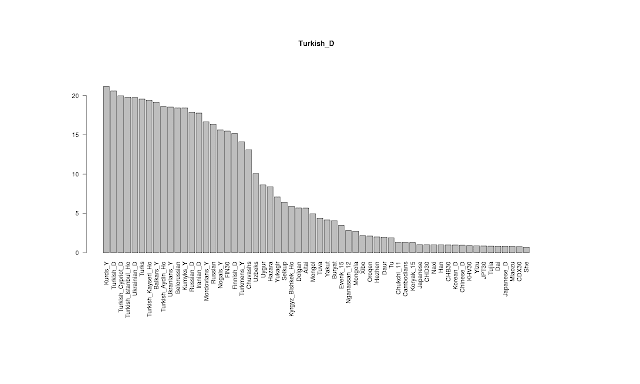 I have included the new Turkish data from Hodoğlugil & Mahley (2012) in this analysis. Additionally, there are now 5 participants in the Serb_D and Turkish_Cypriot_D sub-populations, as well as a Bosnian Muslim. There are now project participants from many Balkan countries, although Albania, the fYROM, and Croatia remain as "black holes" in the map. Still, I am hopeful that there will be more project participants from currently under-represented populations. 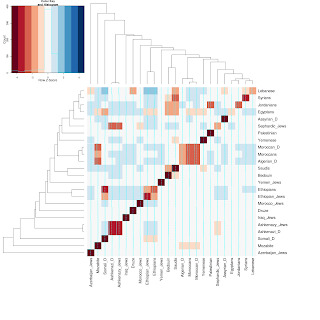 I have already started processing the same dataset with ChromoPainter (which takes much longer), and hopefully that analysis will be posted at the end of this week or the beginning of the next one. 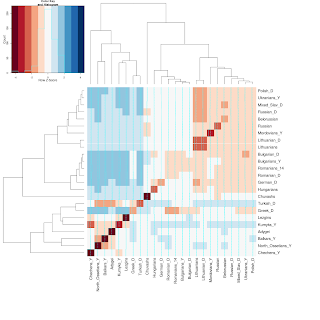 Remember that the tree groups similar populations together, and for each row in the matrix, the red end of the spectrum indicates lots of IBD sharing, and the blue end low IBD sharing. Additionally, I have now calculated the median IBD sharing, which is more resistant in the presence of potential relatives in the data. 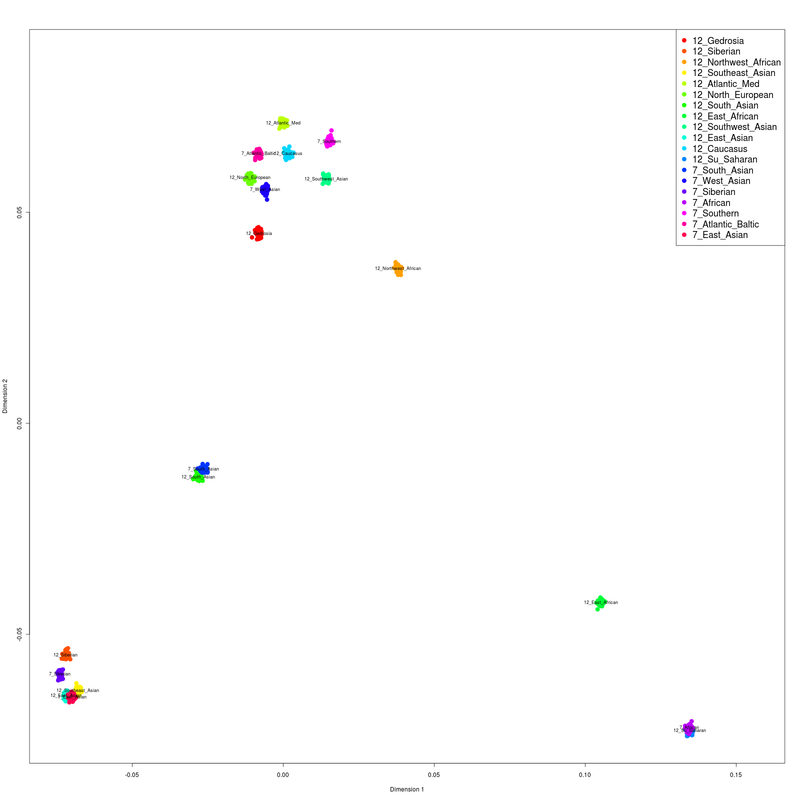 The results appear fairly reasonable, with the Balkan, Anatolian, and Italian populations of the title forming separate branches, and the mainland Greek sample joining with Central/South Italians and Sicilians. 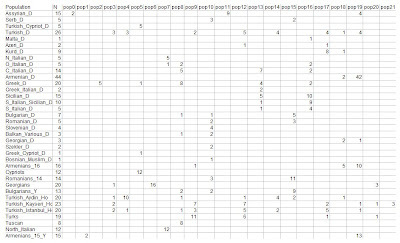 Results for Project participants can be found in the spreadsheet, and include the probabilities that each ID is assigned to each of the 28 clusters, as well as the Z-scores comparing each individual against all populations with 5+ individuals. 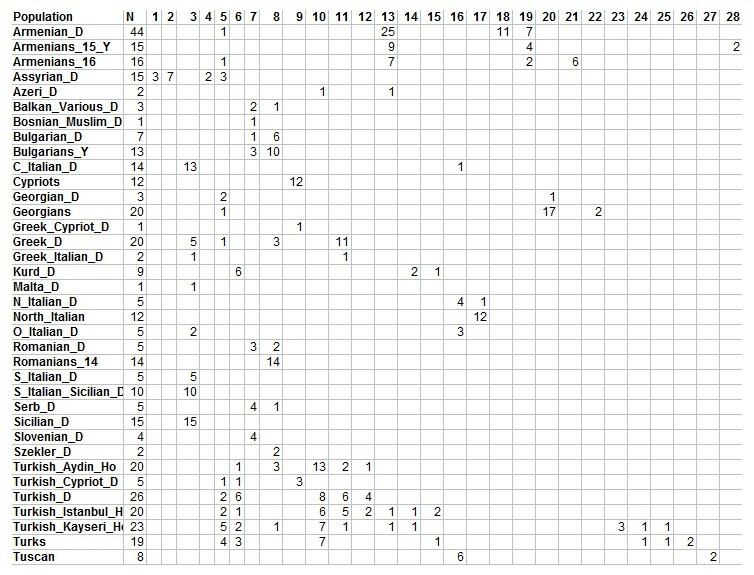 The Z-score should be read as follows: for each row, high values indicate a high degree of IBD sharing, while low values indicate a low degree of IBD sharing. Of course, I encourage Project participants to leave a message in the Information about Project samples thread. I am releasing two new calculators with K=12 and K=7 components, named 'K12b' and 'K7b'. You can scroll down to the bottom if you are just interested in the downloads, or read on. The new 'K12b' calculator is an update of the previous K12a one, that was inferred using all the new samples submitted during the last submission opportunity. The 12 components are still roughly the same, although their allele frequencies may have changed by a bit, so existing participants can expect to have slightly altered results, and new participants in the Project more so, since their data are now contributing to the creation of the new tool. Non-participants can, of course, use the new calculator with DIYDodecad. I have also taken the opportunity to do some minor tweaks. 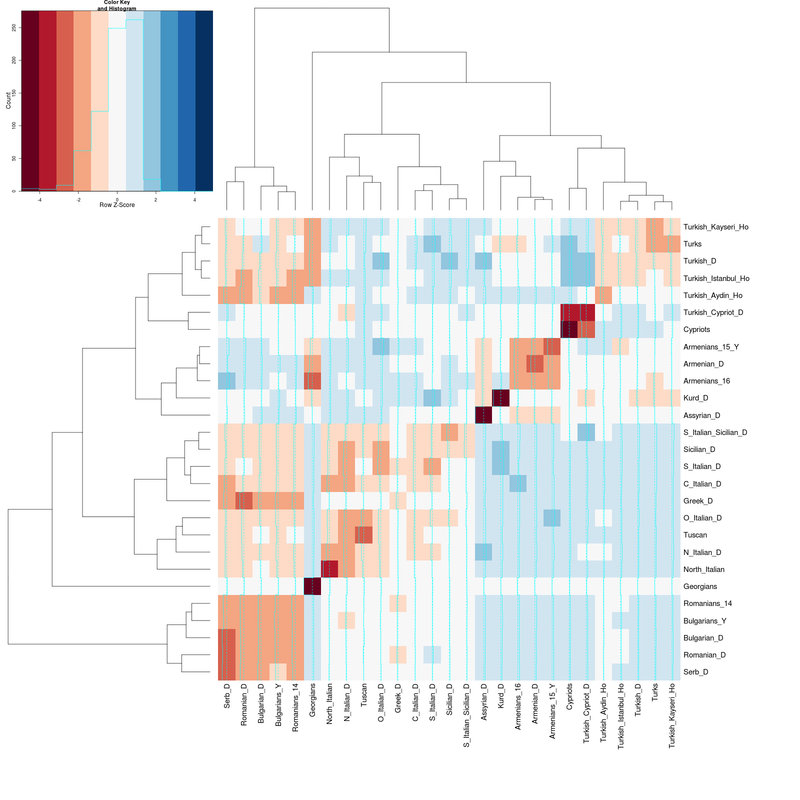 I am releasing population portraits for K12b (which were lacking in K12a); I've changed my visualization code so that the sample IDs of non-Dodecad populations can now be seen in the barplots. 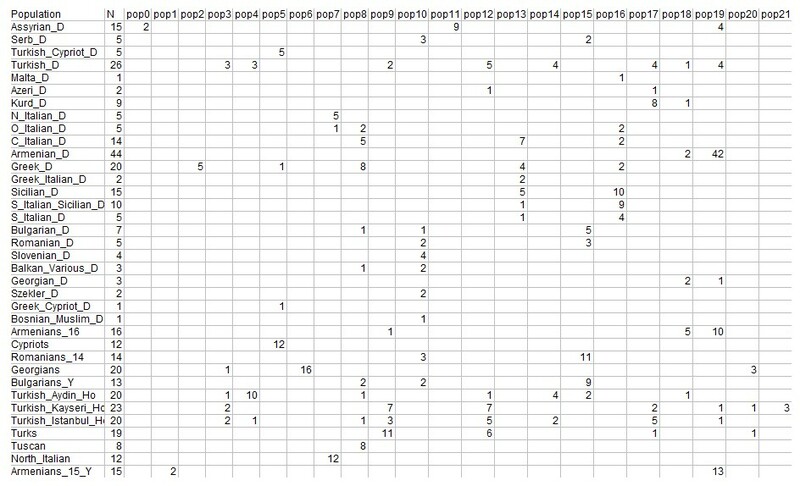 This may be useful for anyone else using these reference populations, by quickly identifying potential outliers in them. 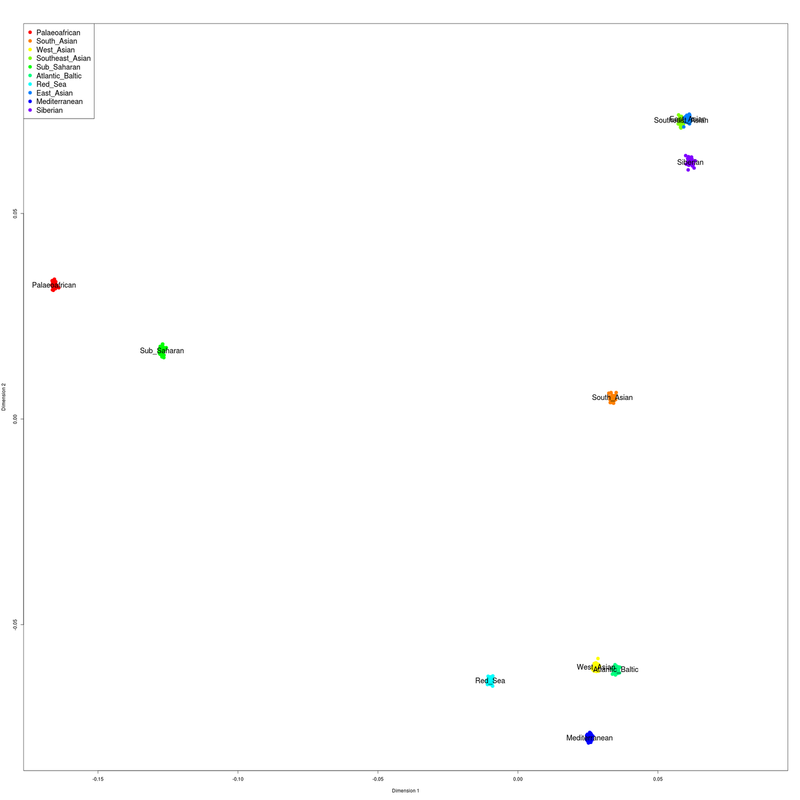 I have also decided to use normalized median admixture proportions for the populations. For example, if 5 individuals in a population have 0, 0, 0.2, 0.5, 10.0% of a particular component, then the average is 2.14%, but the median is 0.2%. By using the median, the proportions become less susceptible to the presence of outliers (such as the 10%). However, if the median is calculated over every component separately, it is no longer guaranteed that the components will add up to 100%; this can be addressed by re-normalizing them (scaling them by a constant factor) so that they do. I believe that use of the normalized median will not only give better proportions that are less susceptible to outliers, but will also improve results of the new Dodecad Oracle for K12b. At the same time I am also releasing 'K7b' which is an update of the existing 'eurasia7' calculator and which has been built on exactly the same dataset as 'K12b' but at a lower (K=7) level of detail. 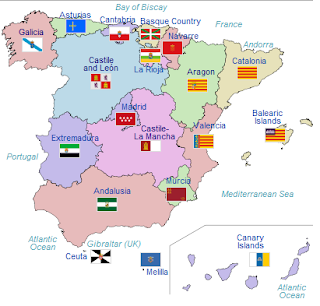 The Atlantic_Med component which is bi-modal in Basques and Sardinians occupies the apex of the figure; this makes sense, since Southwest Europe is quite distant (along land routes) to both Asia and Africa. The Caucasus component is surrounded by most of the others; this is consistent with my theory elaborated in The womb of nations: how West Eurasians came to be. 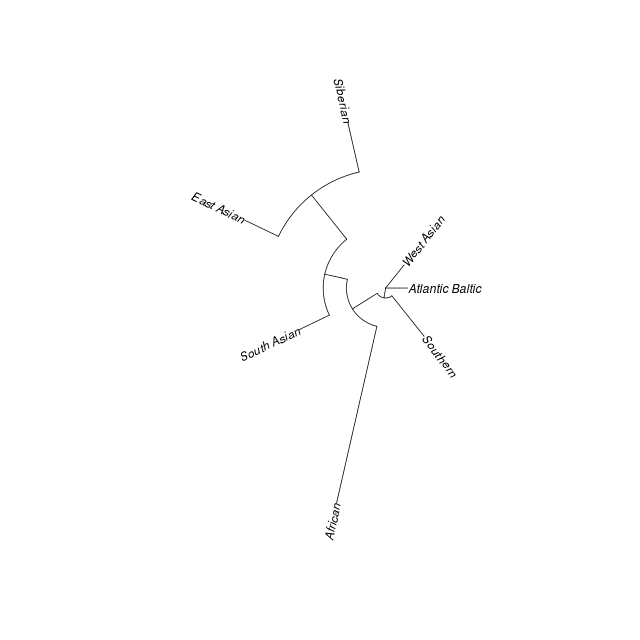 The Atlantic_Baltic component (from K=7) is intermediate between the Atlantic_Med and North_European components. 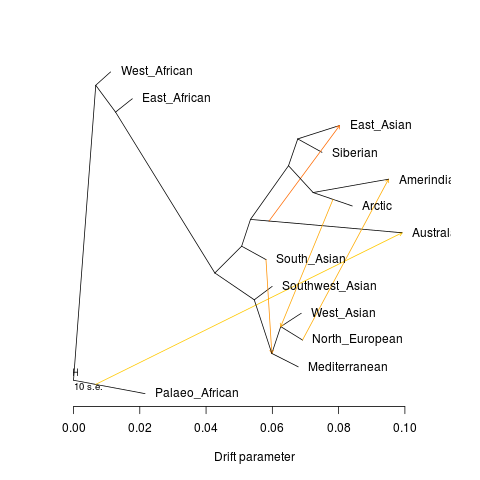 Similarly, the West_Asian component (from K=7) is intermediate between the Caucasus and Gedrosia components; the Gedrosia component diverges in the direction of the Asian groups (not shown in this figure), and in particular of South Asians. This divergence can also be seen in the plot of dimension #3. The Northwest_African component diverges in the direction of Sub-Saharan Africans. 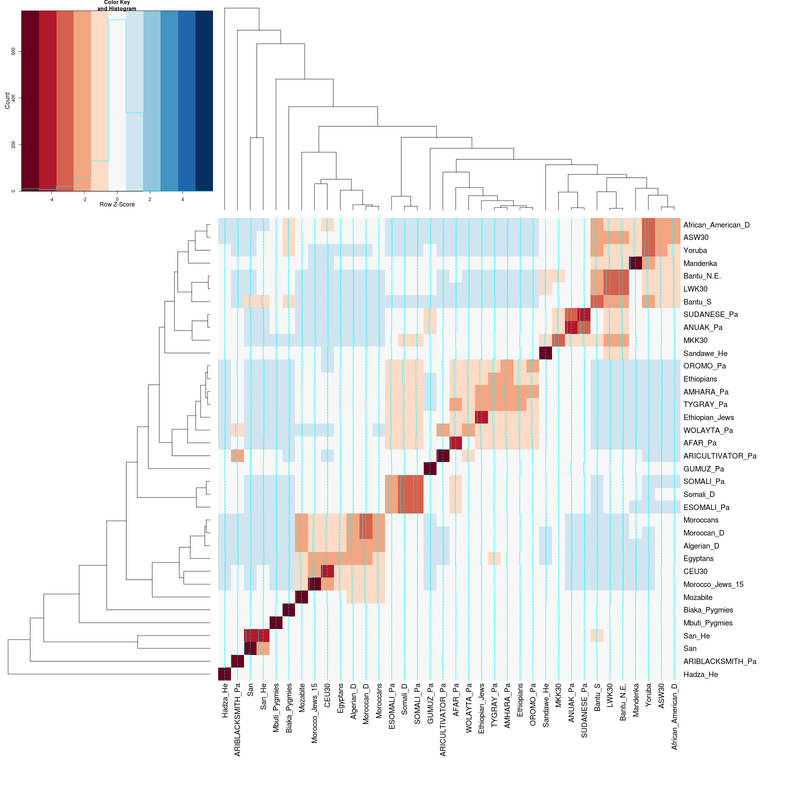 A dataset of 268 populations/3,115 individuals was assembled. A total of 265,519 SNPs are in common in the various source datasets as well as the 23andMe v2/v3 and Family Finder platforms. 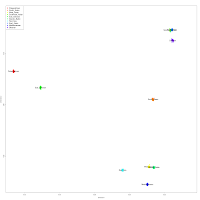 Iterative removal of distant relatives was performed by removing one individual from each pair within a population if that pair had a RATIO of 2.5 or greater or more than the mean and two standard deviations in IBD analysis performed in PLINK 1.07. A total of 2,675 individuals remained. 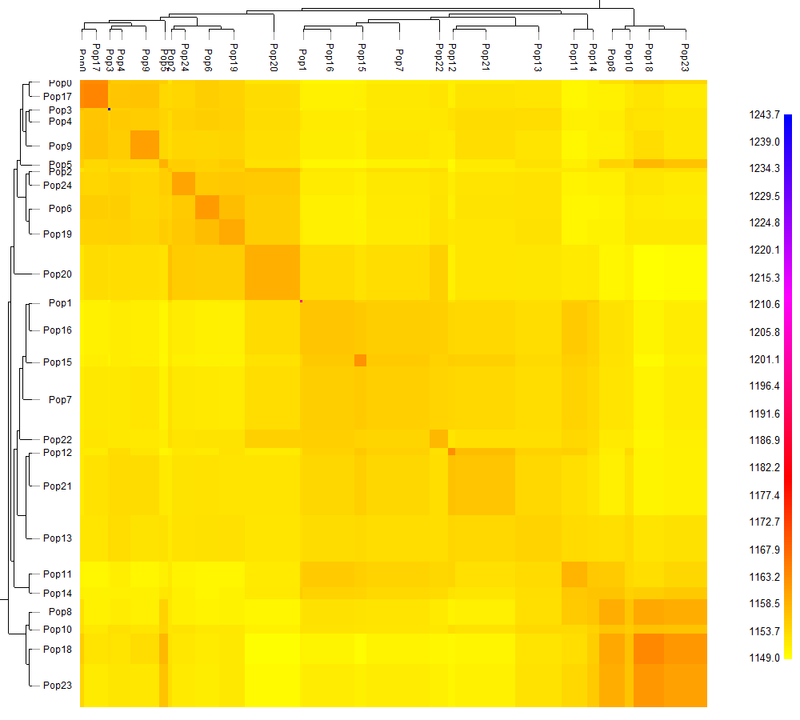 4 individuals were removed for low genotyping rate (less than 97%). 264,328 SNPs remained after removal of SNPs with less than 97% genotyping rate or 1% minor allele frequency. 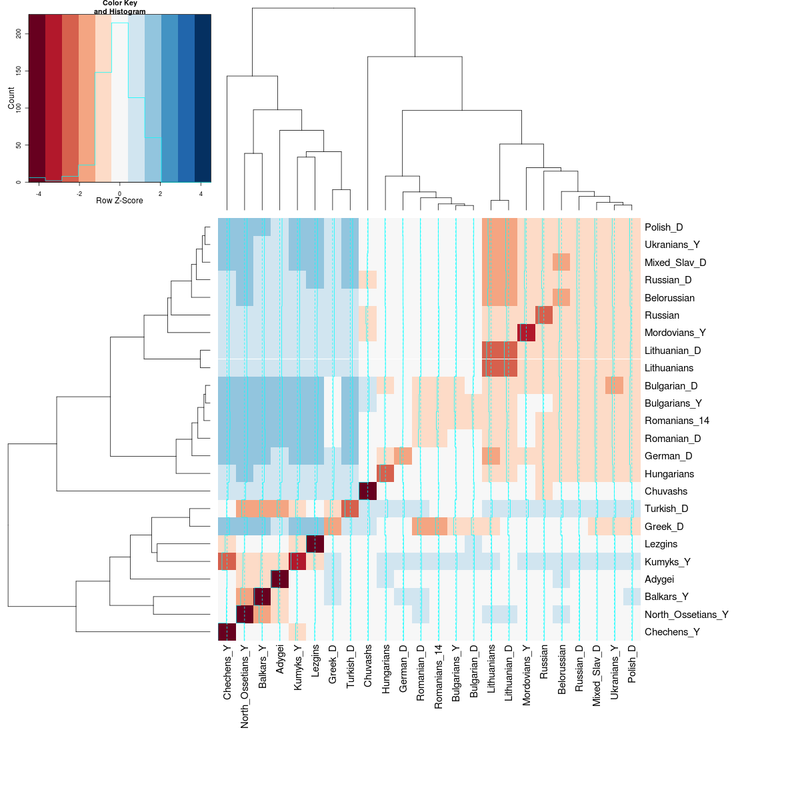 166,770 SNPs remained after linkage-based disequilibrium pruning (--indep-pairwise 200 25 0.4). 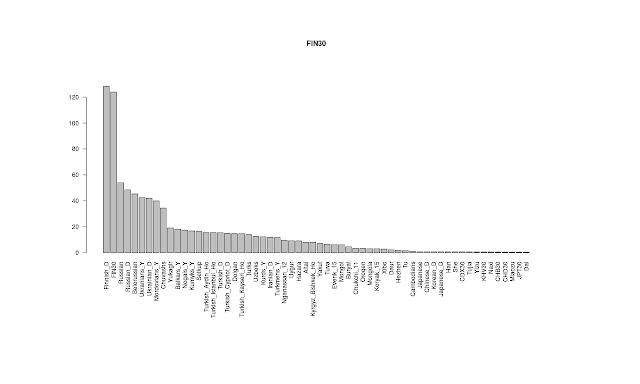 The final set thus consisted of 2,671 individuals/268 populations/166,770 SNPs. 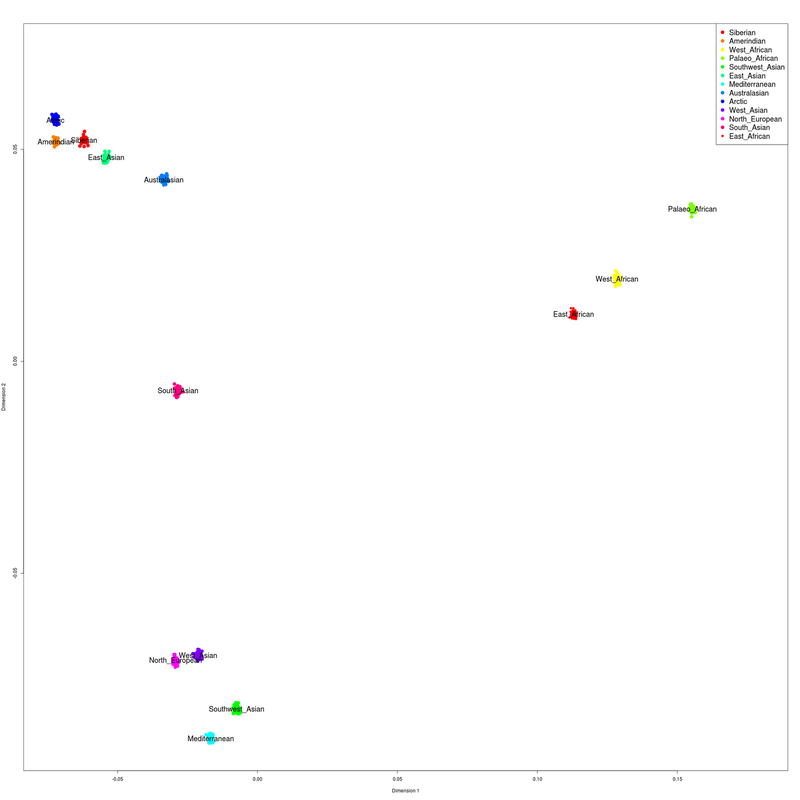 Ancestral populations (components) were inferred using ADMIXTURE 1.21, with K=7 and K=12 and default parameters. 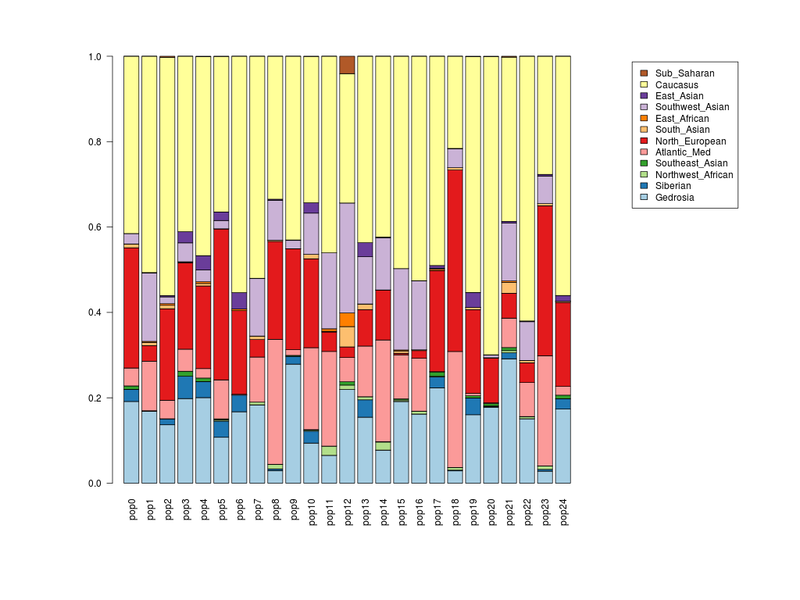 No individuals were removed from the source datasets, except in the case of the Armenians_Y sample, where one individual (ID: armenia3) was dropped because he/she was the same as a Dodecad Project participant. 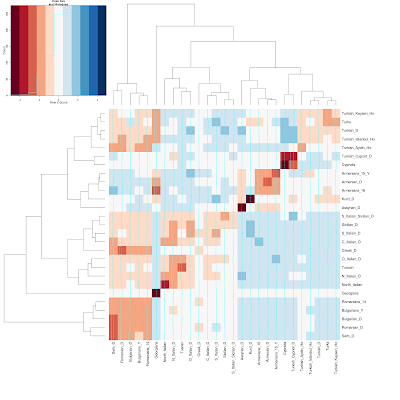 K7b population portraits, spreadsheet, and DIYDodecad files. 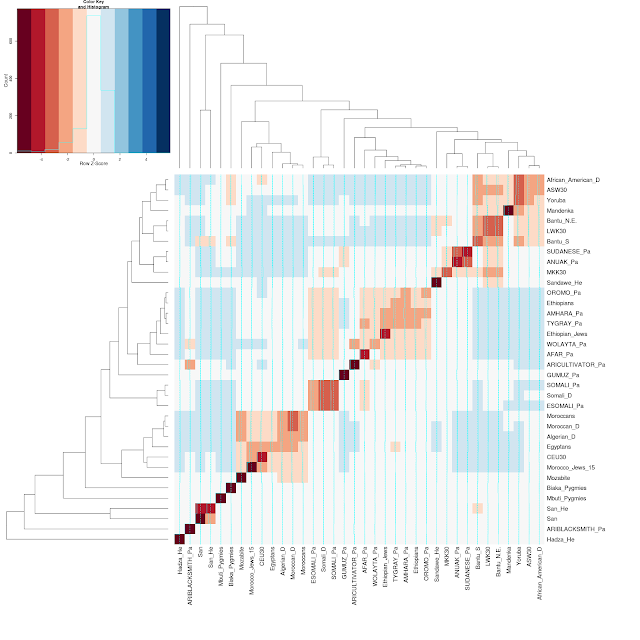 K12b population portraits, spreadsheet, and DIYDodecad files. Dodecad Oracle (K12b edition) can be downloaded from here. Please read the instructions of the previous Oracle on how to use this tool. Note that the number of populations is now 223. To use either calculator with DIYDodecad, with your 23andMe or Family Finder data, follow the instructions in the README file, but substitute 'K12b' or 'K7b' for 'dv3'. Project participant results for both K7b and K12b are found in the spreadsheets in the Individual Results tab. The [K7b/K12b] admixture calculator is courtesy of Dienekes Pontikos and was developed as part of the Dodecad Ancestry Project; more information here. Everyone on the planet is invited to submit their data, regardless of their ancestry. All other rules apply, especially the no relatives clause. Additionally, I will accept a single submission from each submitter, so don't submit all your friends. Moreover, regardless of your ancestry, you should let me know the origin of your four grandparents. There are 35 spots open, so hurry, since last time I had a free-for-all I had to close it down after about 12 hours due to overwhelming demand. I will close project submission after I assign DOD999. All submissions after I post the end-of-submission announcement on the blog will be ignored. If you post this in any forums or mailing lists, include this post link so that people will know whether the opportunity is over. Please refer to the previous analysis on the Balkans/West Asia for more information about the interpretation of this type of analysis. 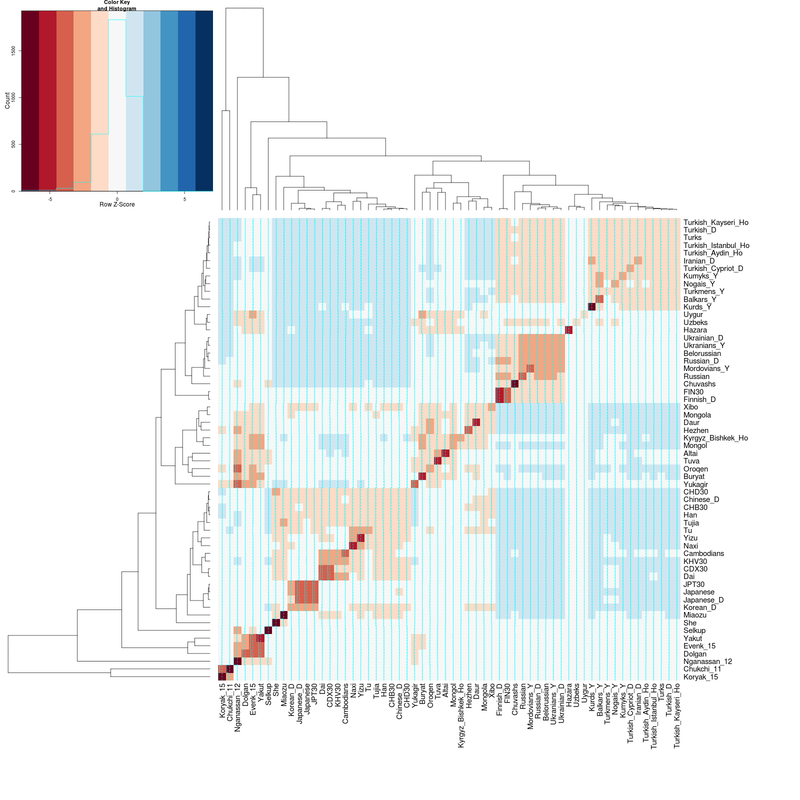 I am very pleased with the way this analysis of Afroasiatic groups has turned out, revealing an exceptional degree of resolution. I invite individuals from the Near East and Africa who are eligible, to submit their data, so that they can be included in future runs of this kind. 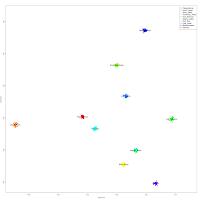 45 clusters were inferred with 29 dimensions. 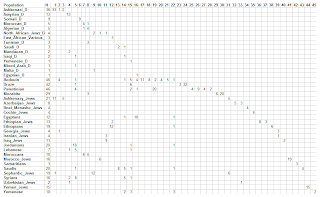 The results can be found in the spreadsheet. I have also added the full IBD sharing matrix which lists how many Morgans of sequence are estimated to be IBD with probability greater than 10^-6 between all pairs of individuals. You can google any non-Project sample IDs to get some more information about their origin. For example, GSM536710 is an Iraqi Jew who shares about half his genome with GSM536714, also an Iraqi Jew. These two samples are almost certainly first-degree relatives. Or, GSM537032, a Samaritan shares 740-1,480cM with the other 2 Samaritans, an exceptional amount in this small and probably highly inbred population. If you belong to a population with few other participants, you might end up latching onto a cluster dominated by a bigger group. This does not mean that your population is not distinctive, only that there are not enough samples to reveal its distinctiveness if it exists. 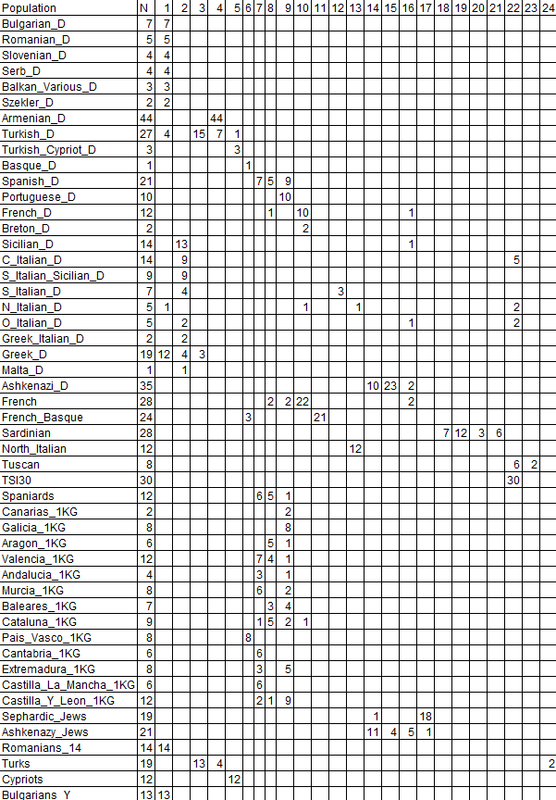 Results can be found in the spreadsheet. If you have joined the Project, please consider leaving a comment in the Information about Project samples thread. 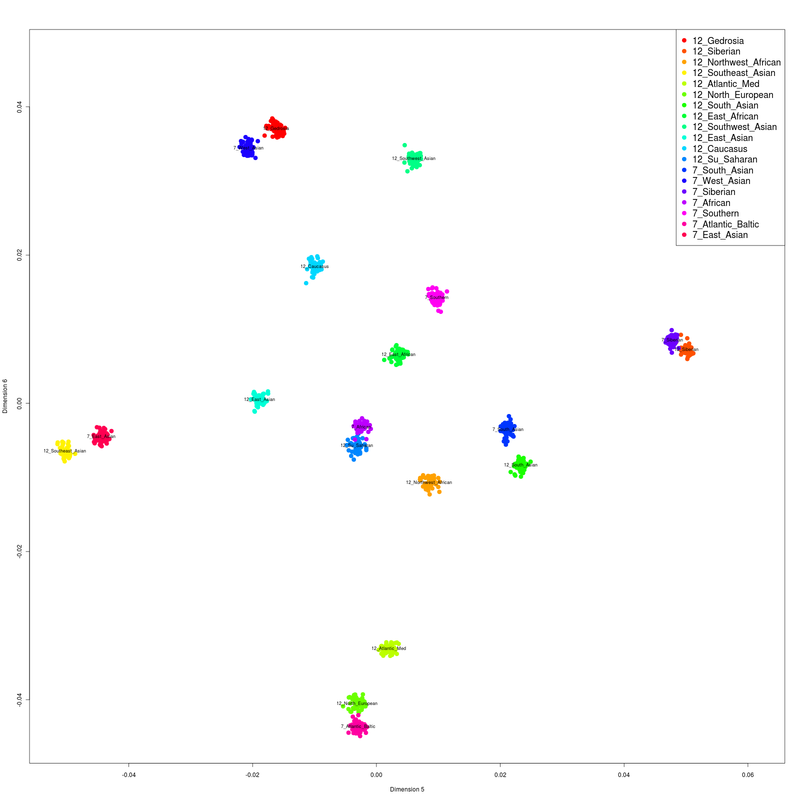 That will help others make better sense of their results, e.g., if you find that you belong in the same cluster with some other individual, you might want to know something about their origins. UPDATE: I have added the IBD sharing matrix.See here on how to use it. They can be found in the spreadsheet. 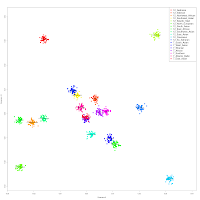 Many Project participants belong to a population with 1 or 2 individuals, so cluster #1 seems to be a generalized catch-all for many such individuals. 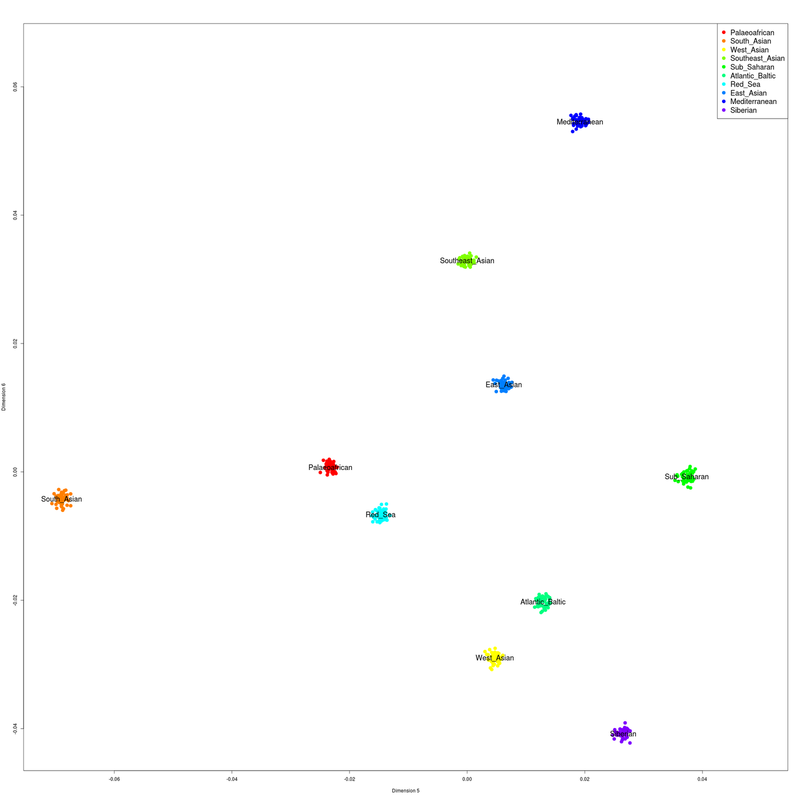 Individuals from he two sub-populations that I've identified recently Iyer_D, and Jatt_D all belong to the same cluster. 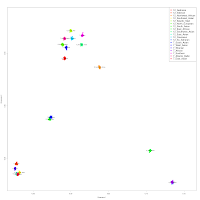 The Iyer_D cluster (#4) also seems to include the Iyengar project participants as might be expected. 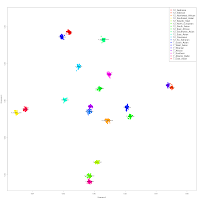 It is also interesting how all Dodecad participants fall in just 7 of the 59 clusters. This goes to show how truly diverse people from the Indian subcontinent are. I fully expect that with more participation further structure will be revealed, since it seems that due to endogamy it only takes a few participants from each ethnic group for a specific cluster pertaining to that group to be identified. So, I invite people from South Asia to join the Project during this submission opportunity. On the heels of the previous analysis of Balkans/West Asia, a new experiment on a different set of populations. Please refer to the earlier post for some thoughts/explanations about this type of analysis, I'll stick to "just the data" for this post. 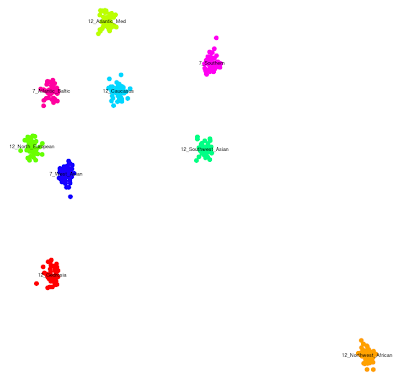 24 clusters inferred with 17 MDS dimensions. The Galore analysis provides increased resolution within Iberia (#6-9, 11), Italy, and the Ashkenazi Jewish group (#14-16). 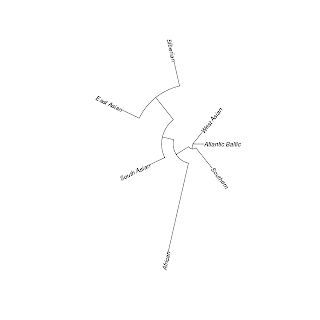 a smaller Aragon/Cataluna cluster (#8). 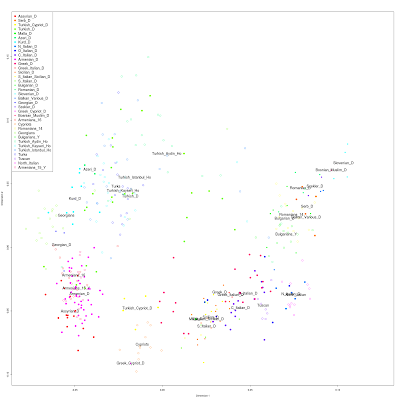 There is overlap between these clusters, but the geographical contrasts are quite evident. I did not go through the results of Spanish Project participants (all the Portuguese fall in the Galician cluster, and our Basque member in the Basque cluster as expeccted), so it would be interesting to hear whether they fall in the cluster(s) which exist in their regions of origin.